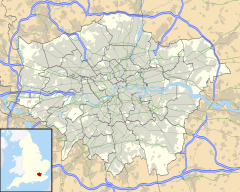 Barnes (/bɑːrnz/) is a district in the London Borough of Richmond upon Thames. It takes up the extreme northeast of the borough (and as such is the closest part of the borough to central London). It is centred 5.3 miles (8.5 km) west south-west of Charing Cross in a bend of the River Thames. Its built environment includes a wide variety of convenience and arts shopping on its high street and a high proportion of 18th- and 19th-century buildings in the streets near Barnes Pond. Together they make up the Barnes Village conservation area where along with its west riverside, pictured, most of the mid-19th century properties are concentrated. On the east riverside is the WWT London Wetland Centre adjoining several fields for the three main national team sports. Barnes has retained woodland on the "Barnes Trail" which is a short circular walk taking in the riverside, commercial streets and conservation area, marked by silver discs set in the ground and with QR coded information on distinctive oar signs. The Thames Path National Trail provides a public promenade along the entire bend of the river which is on the Championship Course in rowing. Barnes has two railway stations (Barnes and Barnes Bridge) and is served by bus routes towards central London and Richmond. Barnes is in south west London, bounded to the west, north and east by a meander in the River Thames. Both stations are served exclusively by trains operated by South Western Railway (SWR), with trains terminating in Central London at Waterloo via Clapham Junction. Trains from Barnes and Barnes Bridge both run eastwards providing Barnes with a direct connection to Chiswick, Brentford and Hounslow. Barnes railway station is also served by trains running southwest towards Teddington and Kingston. Barnes railway station saw 2.548 million passenger entries or exits last year. Barnes Bridge was significantly quieter, with only 0.863 passengers beginning or ending their journey at the station. Nearby railway stations can also be found at Putney and Mortlake. There are London Underground connections in neighbouring Hammersmith[disambiguation needed], where two stations serve four lines: the Circle, Hammersmith & City, District and Piccadilly lines. From Hammersmith, there are direct connections to the City and the West End. There are also direct connections to Heathrow Airport, Ealing, the East End and Rayner's Lane. There is one River Thames crossing in Barnes for traffic and pedestrians; Hammersmith Bridge is a suspension bridge to the north of Barnes, built in 1887. Many of the roads in Barnes are residential, but several arterial routes pass through the district, carrying traffic across London and the South East. The South Circular Road (A205) passes through the southern end of Barnes. The South Circular carries traffic eastbound towards Wandsworth, Clapham, the City of London and south east London. Westbound, the road carries traffic away from Central London, either towards Richmond and the M3, or directly to the M4 and the North Circular Road (A406). Kew and Chiswick are en route to the M4. The A306 runs north-south through Barnes, carried by Castelnau and Rocks Lane. Leaving Barnes to the north, the A306 crosses Hammersmith Bridge towards Hammersmith, where traffic meets the Great West Road (A4), which links to Earl's Court and the West End. Southbound, the A306 eventually meets the A3 towards Guildford and Portsmouth. Barnes High Street and Church Road carry the A3003, which runs between Barnes and nearby Mortlake. Transport for London (TfL) manages the South Circular Road and the A306 (south of Barnes only). Other roads which cross the Thames nearby are Chiswick Bridge (A316) to the west and Putney Bridge (A219) east. The London Borough of Richmond upon Thames carries out air pollution monitoring in Barnes, both kerbside and in the London Wetlands Centre. There are several sites in Barnes which measure the concentration of Nitrogen Dioxide (NO2) and Particulate Matter (PM10) in the air. A site along Castelnau recorded an annual mean concentration of NO2 at 31μgm-3 in 2017. The annual mean concentration of PM10 was 18μgm-3 at the same site in the same year. Both results show that Barnes' air is the cleanest it has been since 2011, at least. Whilst Castelnau is on the kerbside, the Wetlands monitoring site recorded far lower (i.e. cleaner) results than Castelnau did in 2017, with an annual mean NO2 concentration at 21μgm-3, and a mean reading of 15μgm-3 for PM10. A monitoring site on Barnes High Street recorded more polluted air than the other, with NO2 levels at 43.0μgm-3 (annual mean, 2017). This site therefore failed to meet the UK National Air Quality Objective of 40μgm-3 (annual mean) for NO2. from west-east: Barnes Pond, Glebe Rd., Red Lion. The section with only London United that contains Ranelagh Ave. is called Rocks Lane. & Barnes Bridge. This is predominantly a hail and ride section. Some 283 buses go to Barnes Pond instead of Wetlands Centre. Compared other districts in London, Barnes is poorly connected to London destinations via cycle paths or tracks; cycling infrastructure is limited in Barnes. National Cycle Route 4 (NCR 4) - signed cycle route from Greenwich to Fishguard, West Wales. Runs mainly on shared-use paths or residential streets, but in Barnes, the route follows Rocks Lane (A306) for a short distance. For cyclists in Barnes, the route provides an unbroken, albeit indirect, route towards Waterloo via Putney and Chelsea. To the West, NCR 4 passes through Roehampton, Richmond Park and Kingston-upon-Thames. London Cycle Network 37 - part of the discontinued London Cycle Network. Many signs still remain along this route in Barnes. The route runs eastbound towards Wandsworth, Vauxhall and the City, or westbound towards Mortlake and Richmond. EuroVelo 2 ("The Capitals Route") - part of the EuroVelo network, EV2 runs from Moscow, Russia to Galway, Ireland. It is unsigned in Barnes, but it follows the route of NCR 4 between Greenwich and Chepstow, Monmouthshire. Cycles can cross the Thames in Barnes using either Hammersmith Bridge or Barnes Bridge (dismounting to use the footpath). Cycling is permitted along the shared-use path on the southern bank of the Thames between Hammersmith Bridge and Putney Bridge. The Thames Path passes through Barnes, following the banks of the river. Transport for London (TfL), in conjunction with MBNA Thames Clippers, run riverboat services from nearby Putney Pier to Blackfriars, weekday morning and evenings only. This connects the Barnes area to Chelsea, Battersea, Westminster, Embankment and the City. A Summer River Tour, operated by Thames River Boats runs from Kew Pier to Westminster, or Richmond and Hampton Court. Barnes is in the traditional county of Surrey. It appears in the Domesday Book of 1086 as "Berne". It was held by the Canons of St Paul of London when its assets were: 8 hides, paying tax with Mortlake; 6 ploughlands, 20 acres (81,000 m2) of meadow. It rendered (in total) to its feudal system overlords £7 per year. The original Norman chapel of St Mary's, Barnes' village church, was built at some point between 1100 and 1150, and was subsequently extended in the early 13th century. In 1215, immediately after confirming the sealing of the Magna Carta, Stephen Langton, the Archbishop of Canterbury, stopped on the river at Barnes to dedicate St Mary's church. The church was added to in 1485 and in 1786. After a major fire in 1978 destroyed the Victorian and Edwardian additions to the building, restoration work was completed in 1984. Some of the oldest riverside housing in London is to be found on the Terrace, a road lined with Georgian mansions which runs along the west bend of the river. Construction of these mansions began as early as 1720. Gustav Holst and Ninette de Valois lived in houses on this stretch, both of which have corresponding blue plaques. The Terrace also has an original red brick police station, built in 1891. It has been remodelled as flats but still preserves the original features. The pink-fronted Rose House facing the area's pond dates to the 17th century, while Milbourne House facing the Green, the area's oldest, parts of which date to the 16th century, once belonged to Henry Fielding. The park of Barn Elms, formerly the manor house of Barnes, for long the parish's chief property and now an open space and playing field, is home to one of the oldest and largest plane tree in London, one of the Great Trees of London. The Grade II listed Barnes Railway Bridge, originally constructed in 1849 by Joseph Locke, dominates the view of the river from the Terrace. A 2014 survey found that Barnes had the highest proportion of independent shops of any area in Britain, at 96.6%. Olympic Studios on Church Road is an independent cinema, showing a mixture of films on general release and art films. Originally a local cinema and for many years a leading recording studio, down the decades Olympic played host to some of rock and pop's greatest stars, from the Beatles, who recorded the original tracks of "All You Need Is Love" in Barnes, to the Rolling Stones, Jimi Hendrix, Pink Floyd, Led Zeppelin, David Bowie, Queen, Eric Clapton, Ella Fitzgerald, Harry Nilsson, the Verve, Massive Attack, Duran Duran, Coldplay, Madonna and Björk. The area around Barnes Pond is host to several open-air and covered markets each month. Barnes Green is the site of the Barnes Fair, held each year on the second Saturday of July and organised by the Barnes Community Association (BCA), whose headquarters are at Rose House, a distinctive 17th-century pink-painted building on Barnes High Street. Barnes and Mortlake History Society, founded in 1955, promotes interest in the local history of Barnes, Mortlake and East Sheen. It organises a programme of lectures and other activities on historical topics and publishes a quarterly newsletter. Barnes has a place in the history of football. First, a former High Master of St Paul's School, Richard Mulcaster, is credited with taking mob football and turning it into an organised, refereed team sport that was considered beneficial for schoolboys. St Paul's School is currently sited on Lonsdale Road, although in Mulcaster's time it was at St Paul's Cathedral in the City of London. Barnes was also home to Ebenezer Cobb Morley, who in 1862 was a founding member of the Football Association. In 1863, he wrote to Bell's Life newspaper proposing a governing body for football, and this led to the first meeting at the Freemasons' Tavern where the FA was created. He was the FA's first secretary (1863–66) and at his home in Barnes he set out the first set of rules for modern football, and these were adopted by the FA and subsequently spread throughout the world. As a player, he took part in the first match played according to today's rules. Morley may be considered the father of football for his key role in establishing modern Association Football. Barnes has a non-League football club, Stonewall F.C., who play at Barn Elms Playing Fields. Barnes Rugby Football Club's ground is next to the WWT London Wetlands Centre, formerly known simply as Barn Elms. In rowing, the loop of the Thames surrounding Barnes forms part of the Championship Course used for the Oxford and Cambridge Boat Race and the main national head races, the Head of the River Races, for each category of Olympic boat. Three rowing clubs are across Barnes Bridge which can be crossed by foot and St Paul's School boat from Barnes. A statue of Steve Fairbairn who revolutionised technique and equipment in the sport is by the river close to the London Wetlands Centre in the district. Only notable people with entries on Wikipedia have been included. Their birth or residence has been verified by citations. Joss Ackland (b. 1928), actor, lived in Barnes. Michael Ball (b. 1962), singer and actor, lived in Barnes. Samantha Bond (b. 1961), actress, was brought up in Barnes and St Margarets. Niamh Cusack (b. 1959), actress, lives in Barnes. Patricia Hodge (b. 1946), actress, lives in Barnes. Peter Mayhew (b. 1944), who played Chewbacca in the Star Wars films, was born and brought up in Barnes. Alistair McGowan (b. 1964), comedian, lives in Barnes. Robert Pattinson (b. 1986), actor, lives in Barnes. Stanley Tucci (b. 1960), actor, lives in Barnes. Julia Watson (b. 1953), actress, lives in Barnes. Jan Pieńkowski (b. 1936), artist, lives in Barnes and is a patron of the Barnes Literary Society. Carl Davis (b. 1936), composer, lives in Barnes. Duffy (b. 1984), singer, lived at The Terrace in Barnes. Tomoyasu Hotei (布袋 寅泰) (b. 1962), Japanese musician, singer-songwriter, composer, record producer and actor, moved to Barnes in 2012. Brian May (b. 1947), musician and astrophysicist, lived in Suffolk Road, Barnes. Roger Waters (b. 1943),bassist formerly of Pink Floyd, lives on Barnes Common. Roger Taylor (b. 1949), drummer, lived in White Hart Lane. Pete Tong (b. 1960), disc jockey, lives in Barnes. Zac Goldsmith (b. 1975), MP for Richmond Park, lives in Barnes. Susan Kramer, Baroness Kramer (b. 1950), life peer and former MP for Richmond Park, lives in Barnes. Dr Tania Mathias (b. 1964), MP for Twickenham from 2015 to 2017, was brought up in Barnes. Chris Patten, Baron Patten of Barnes (b. 1944), life peer, Chancellor of the University of Oxford, and former MP for Bath who subsequently served as 28th Governor of Hong Kong and Chairman of the BBC Trust, lives in Barnes. Suzannah Lipscomb (b. 1978), historian, academic and broadcaster specialising in the 16th century, lives in Barnes. Dan Snow (b. 1978), historian and broadcaster, grew up in Barnes. Sir Michael Edwards OBE (b. 1938), poet and academic, was born in Barnes. David Harsent (b. 1942), poet, lives in Barnes. Judith Kerr (b. 1923), author and illustrator, lives in Barnes. Matthew Kneale (b. 1960), novelist, was brought up in Barnes. Roger McGough (b. 1937), performance poet, broadcaster, children's author and playwright, lives in Barnes. Sheherazade Goldsmith (b. 1974), environmentalist, jeweller and columnist, lives in Barnes. Chris Kimsey (b. 1951),sound engineer, producer, associated with The Rolling Stones and Olympic Studios lives on Barnes Common. Gary Lineker (b. 1960), sports broadcaster and former professional footballer, lives in Barnes. Those marked § are commemorated in Barnes by a blue plaque. Rosemary Ackland (1951–2002), actress, lived in Barnes. Phyllis Calvert (1915–2002), actress, lived in Barnes. Jimmy Edwards (1920–1988), comedy actor and writer, was born in Barnes. Rik Mayall (1958–2014), actor, writer and comedian, lived and died in Barnes. John Moody (c. 1727–1812), actor, lived at 11 The Terrace, Barnes, from about 1780 until his death. He is buried at St Mary's Church, Barnes with his two wives. Jimmy Perry (1923–2016), actor and scriptwriter, co-creator of the TV series Dad's Army and Hi-de-Hi, was born in Barnes. Jon Pertwee (1919–1996), Doctor Who actor, had a family house in Barnes. Terry-Thomas (1911–1990), comic actor, moved to a flat in Barnes in 1988. Frank Thornton (1921–2013), actor (Captain Peacock in the BBC comedy Are You Being Served? ), lived and died in Barnes. Thomas Allom (1804–1872), architect, artist, topographical illustrator and a founding member of what became the Royal Institute of British Architects (RIBA), designed Holy Trinity Barnes and lived locally at 1 Barnes Villas (now 80 Lonsdale Road), Barnes, where he died on 21 October 1872. Gillian Ayres CBE RA (1930–2018), artist, grew up in Barnes. Sidney Richard Percy (1821–1886), landscape painter, lived with his father at 32 Castelnau Villas (92 Castelnau), Barnes, from 1845 to 1856. Henry William Pickersgill (1782–1875), portrait painter, lived at Nassau House, Barnes Green, from about 1854 to 1857. He is buried in Barnes Cemetery with his wife, who died in 1857. Major John Freeman (1915–2014), politician, diplomat and broadcaster, lived in Barnes. Lyon Playfair (1818–1898), professor of chemistry and Liberal MP, lived at 26 Castelnau Villas (98 Castelnau), Barnes in 1851, while taking part in organising the Great Exhibition. Sir John Power, 1st Baronet (1870–1950), businessman and Conservative MP for Wimbledon, lived at 1 Queen's Ride, Barnes, from 1908 to 1919. Vice-Admiral Alfred Carpenter VC (1881–1955), Royal Navy officer, was born in Barnes. Lieutenant-General Robert Ballard Long (1771–1825) retired to his house on The Terrace. Freddie Mercury (1946–1991), musician, vocalist and lyricist of the rock band Queen, shared a house at 40 Ferry Road. Colin Patterson (1933–1998), palaentologist, lived in Barnes. Albert Frederick Pollard (1869–1948), historian and founder of the Historical Association, lived at 7 St Mary's Grove. Sir John Russell Reynolds, 1st Baronet (1828–1896), British neurologist and physician, President of the Royal College of Physicians, 1893–95, occupied Rose Cottage, Barnes Green, as a weekend cottage from about 1862 to 1870. The Scottish physician, librarian, and medical historian Robert Willis (1799–1878) lived and practised at The Homestead on Church Road from 1846 until his death in 1878. Ebenezer Cobb Morley (1831–1924), sportsman, regarded as the father of The Football Association and modern football, lived in The Terrace at Barnes and is buried in Barnes Cemetery. Nigel Kneale (1922–2006), scriptwriter, lived in Barnes. Eric Newby (1919–2006), travel author, grew up in Castelnau Mansions, Barnes. Barbara Pym (1913–1980), novelist, lived at 47 Nassau Road. Richard Brinsley Sheridan (1751–1816), playwright, poet, theatre owner and MP, who owned Downe House, Richmond Hill, took a house on Barnes Terrace in 1810 when his son Tom was living at Milbourne House. Dodie Smith (1896–1990), author of I Capture the Castle and The Hundred and One Dalmatians, lived in Riverview Gardens. Colin Welland (1934–2015), Oscar-winning screenwriter of Chariots of Fire, lived in Barnes. In 1812, Louis-Alexandre de Launay, comte d'Antraigues (1753–1812) and his wife, the celebrated soprano Madame Saint-Huberty (1756–1812), were murdered at their country home at 27 The Terrace, which they had purchased about three years earlier, by an Italian servant whom they had dismissed. Sir Ralph Moor (1860–1909), high commissioner of the British Southern Nigeria Protectorate, poisoned himself at The Homestead on Church Road in 1909. To give an equal councillor number and electorate, the wards in the London Borough of Richmond upon Thames are multi-councillor but aim to be equally sized. To achieve this, approximately half of one of the two wards covering modern Barnes also falls within the boundaries of neighbouring Mortlake. ^ a b c "London's Rail and Tube services" (PDF). Archived from the original (PDF) on 10 April 2019. ^ "Estimates of station usage". Office of Rail and Road. Archived from the original on 27 March 2019. ^ "TfL Base Map" (PDF). Transport for London (TfL). Archived from the original (PDF) on 7 April 2019. ^ "London Borough of Richmond upon Thames: Air Quality Annual Status Report for 2017" (PDF). London Borough of Richmond upon Thames. 30 May 2018. Archived from the original (PDF) on 13 April 2019. ^ a b "Route 4". Sustrans. Archived from the original on 30 December 2018. ^ "EuroVelo 2: United Kingdom". EuroVelo. Archived from the original on 1 July 2018. ^ "London's River Services map" (PDF). Transport for London (TfL). Archived from the original (PDF) on 8 August 2018. ^ Palmer, J J N. "Place: Barnes". Open Domesday. Retrieved 3 September 2014. ^ "Magna Carta 800th Anniversary, St Mary's Barnes". Magna Carta 800. 6 May 2015. ^ "Short history of the parish church of St Mary Barnes" (PDF). St Mary Barnes. Retrieved 3 September 2014. ^ "Timeline". Barnes and Mortlake History Society. Retrieved 23 July 2012. ^ a b c "Blue Plaques in Richmond upon Thames". Visitrichmond.co.uk. Retrieved 23 July 2012. ^ "London's greatest trees here at BEST". Barn Elms Sports Trust. Retrieved 31 May 2015. ^ "Towns with the greatest percentage of independents are Barnes, where they account for 96.6% of retailers..." "Barnes leads in independent shops". DIY Week. 25 March 2014. Retrieved 26 December 2018. ^ "Barnes Common Conservation area" (PDF). London Borough of Richmond upon Thames. Retrieved 17 December 2015. ^ "Report on Barnes Pond" (PDF). London Borough of Richmond upon Thames. 17 December 2001. Retrieved 17 December 2015. ^ Dyduch, Amy (30 June 2013). "Dozens of people turn out for Barnes trail launch". Richmond and Twickenham Times. Retrieved 7 July 2013. ^ "The Barnes Trail". www.barnesvillage.com. Barnes Community Assoictaion. Retrieved 15 February 2016. ^ uk2.net. "TAG's Marc Bolan & T-Rex Web Site – Legal Guardians of Marc Bolan's Rock Shrine". Marc-bolan.org. Retrieved 23 July 2012. ^ "Barnes". statemaster.com. 9 July 2013. ^ "Barnes in Common: About Churches Together in Barnes". Churches Together in Barnes. Archived from the original on 13 February 2013. Retrieved 6 April 2013. ^ a b c "Barnes And Mortlake History Society". Charity Commission for England and Wales. 31 December 2017. Retrieved 18 October 2018. ^ a b c d "Barnes and Mortlake History Society". Barnes Village. Barnes Community Association. Retrieved 18 October 2018. ^ "Stonewall". Club Information. football.mitoo. Archived from the original on 10 August 2011. Retrieved 31 May 2015. ^ a b "Obituary: Rosemary Ackland". The Daily Telegraph. London. 14 August 2002. Retrieved 9 October 2012. ^ Barber, Richard (27 August 2010). "He's a hit TV host, an iconic stage star and has the most devoted fans in showbiz – Michael Ball is on a roll". Daily Mail. London. Retrieved 22 April 2013. ^ Brocklehurst, Philip (Winter 2011). "Mr Brocklehurst meets..." Mystmargarets.com. p. 28. Retrieved 21 January 2014. ^ "6 random questions… Niamh Cusack". Living In. 28 February 2017. Retrieved 10 May 2017. ^ Parker, Olivia (23 December 2013). "My perfect weekend: Patricia Hodge, actress". The Daily Telegraph. Retrieved 17 December 2015. ^ "'Star Wars' actor becomes U.S. citizen". USA Today. 17 October 2005. Retrieved 27 February 2015. ^ Duncan, Alistair (31 August 2004). "My London: Alistair McGowan". Evening Standard. London. Retrieved 7 November 2018. ^ "Robert Pattinson looks more like a grizzly werewolf than vampire on a day out in London with his sister". Daily Mail. London. 30 December 2009. Retrieved 4 November 2012. ^ Fishwick, Samuel (16 April 2015). "Stanley Tucci's My London". Evening Standard. London. Retrieved 7 November 2018. ^ a b Wroe, Nicholas (21 February 2011). "David Harsent: A life in writing". The Guardian. Retrieved 18 December 2015. ^ a b Bentley, Vicci (Spring 2006). "Presiding Spirits: David Harsent". Magma (35). Retrieved 23 July 2012. ^ "Jan Pienkowski". Barnes Literary Society. Retrieved 21 November 2017. ^ Tibbets, John C (2005). "The Sounds of Silents: An Interview with Carl Davis" (PDF). www.johnctibbetts.co. Retrieved 22 January 2018. ^ "Pop star Duffy's former London house collapses". BBC News. 26 November 2015. Retrieved 10 January 2016. ^ Dyduch, Amy (30 November 2012). "Hotei's living the rock 'n' roll dream – in Barnes". Richmond and Twickenham Times. London. p. 16. ^ a b Skála, Martin. "Queen places in London". Queen Concerts. Retrieved 12 April 2016. ^ Llewellyn Smith, Caspar (22 May 2005). "Jet Set". The Observer. Retrieved 14 September 2014. ^ "Zac Goldsmith on life in West London". The Resident. 12 August 2014. Retrieved 26 December 2018. ^ "FRP announces its new Patrons". News. Friends of Richmond Park. Retrieved 7 April 2014. ^ "Meet Tania Mathias: Your new MP for Twickenham". Richmond and Twickenham Times. 15 May 2015. Archived from the original on 17 July 2015. Retrieved 17 May 2015. ^ Judd, Deany (9 January 2009). "Chris Patten's Perfect Weekend". The Daily Telegraph. Retrieved 30 August 2017. ^ Nathanson, Hannah (6 December 2013). "Suzannah Lipscomb's My London". Evening Standard. London. Retrieved 26 May 2015. ^ Nathanson, Hannah (18 July 2014). "My London". Evening Standard. London. p. 58. Retrieved 22 January 2018. ^ Chrisafis, Angelique (22 February 2013). "Magnifique! Académie française elects first British-born member". The Guardian. Retrieved 27 February 2015. ^ Jardine, Cassandra (26 April 2011). "The cat's whiskers: interview with Judith Kerr". The Daily Telegraph. London. Retrieved 16 January 2016. ^ "Matthew Kneale". Author page. Penguin Books. Archived from the original on 31 December 2013. Retrieved 14 November 2013. ^ "Emma Brockes interview: Roger McGough". The Guardian. London. 14 November 2005. Retrieved 26 April 2010. ^ Cronin, Emily (23 October 2016). "Inside the newly renovated South London home of jeweller Sheherazade Goldsmith". The Sunday Telegraph. Retrieved 26 December 2018. ^ "Gary Lineker on football, crisps and barnes". The Resident. 31 March 2015. Retrieved 26 December 2018. ^ "Phyllis Calvert Biography (1915–2002)". leninimports.com. Retrieved 3 September 2014. ^ Oliver, John. "Edwards, Jimmy (1920–1988)". BFI Screenonline. ^ Ellis-Petersen, Hannah. "Rik Mayall the funniest man". The Guardian. Retrieved 9 June 2013. ^ Dyduch, Amy (9 June 2014). "Comedy idol Rik Mayall dies suddenly at his home in Barnes". Richmond and Twickenham Times. Retrieved 9 June 2014. ^ Brown, Maisie (1997). Barnes and Mortlake Past, with East Sheen. Historical Publications. p. 122. ISBN 978-0-948667-46-6. ^ "Obituary: Jimmy Perry". BBC News. 23 October 2016. Retrieved 29 October 2016. ^ Anstead, Mark (30 January 2011). "Sean Pertwee: 'Why I never expected to be Doctor Who'". The Daily Telegraph. London. Retrieved 17 January 2014. ^ McCann, Graham (5 September 2008). "I say! What a bounder... All dandy comic legend Terry-Thomas really liked was 'jolly eager girls'". Daily Mail. London. Retrieved 6 April 2013. ^ "Are You Being Served? actor Frank Thornton dies aged 92". BBC News. 18 March 2013. Retrieved 23 March 2013. ^ Brooks, Diana. "Allom, Thomas (1804–72)", Oxford Dictionary of National Biography (Oxford, UK: OUP, 2004) Retrieved 13 March 2016. Pay-walled. ^ Hilton, Tim (11 April 2018). "Gillian Ayres obituary". The Guardian. Retrieved 19 October 2018. ^ Rubio, Lorraine (25 August 2014). "artnet Asks: Abstract Painter Gillian Ayres". Artnet. Retrieved 7 November 2018. ^ a b c d e f g "People of Mortlake, Barnes and East Sheen: M – S" (PDF). Barnes and Mortlake History Society. Retrieved 13 October 2012. ^ Purcell, Hugh (7 March 2013). "John Freeman: Face to face with an enigma". New Statesman. Retrieved 21 December 2014. ^ "Alfred Francis Blakeney Carpenter – WW1 memorial and Life Story". Imperial War Museum & D C Thompson. Retrieved 31 March 2018. ^ Proto, Laura (16 April 2015). "World War I submariner and captain of HMS Iron Duke honoured with blue plaque in Barnes". Richmond and Twickenham Times. Retrieved 28 October 2015. ^ Chichester, H. M. "Long, Robert Ballard (1771–1825)", rev. Stearn, Roger T, first published 2004; online edn, May 2008. Oxford Dictionary of National Biography. Retrieved 27 November 2007. ^ Boyes, Valerie (2012). Royal Minstrels to Rock and Roll: 500 years of music-making in Richmond. London: Museum of Richmond. ^ Gunn, Jacky; Jenkins, Jim. "Official Biography". The Freddie Mercury Story. Daria Kokozej. Retrieved 2 May 2014. ^ Fortey, R A (1999). "Colin Patterson. 13 October 1933 – 9 March 1998". Biographical Memoirs of Fellows of the Royal Society. 45: 367–377. doi:10.1098/rsbm.1999.0025. JSTOR 770282. ^ "People of Mortlake, Barnes and East Sheen: T–Z" (PDF). Barnes and Mortlake History Society. Retrieved 1 October 2016. ^ Rudd, Alyson (7 April 2008). "The father of football deserves much more". The Times. London. Retrieved 1 May 2010. ^ "Search for founding fathers of football proves fruitless". Richmond and Twickenham Times. 14 May 2013. Retrieved 4 July 2013. ^ "People of Mortlake, Barnes and East Sheen: E–G" (PDF). Barnes and Mortlake History Society. Retrieved 13 October 2012. ^ "Literary papers of playwright and author Thomas Nigel Kneale including screenplays, scripts, correspondence and press reviews – Archives Hub". Retrieved 26 January 2018. ^ a b c "A history of writing". Barnes: the village on the river. Barnes Community Association. 2010. Retrieved 31 October 2012. ^ Historic England. "Downe House (1249949)". National Heritage List for England. Retrieved 26 September 2012. ^ Kelner, Simon (16 April 1995). ""Colin Welland came from his home in Barnes, southwest London", para.6". The Independent. London. Retrieved 31 December 2013. ^ Bondeson, Jan (28 June 2015). Murder Houses of Greater London. Troubador Publishing Ltd. pp. 93–96. ISBN 978-1-78462-974-8. ^ "No 27, The Terrace". Mortlake and Barnes. Panorama of the Thames. Retrieved 29 September 2016. ^ "Louis-Alexandre De Launay, compte D'Antraigues, 27 The Terrace, Barnes, London". Notable Abodes. Retrieved 29 September 2016. ^ McDonnell, Colleen (9 June 2006). "Plaque dedicated to dancing hero Dame Ninette". Richmond and Twickenham Times. Retrieved 22 April 2013.